Yes, I am more than just another pretty face puffy eyed, caffeine toting, scruffy haired, sweat pant wearing mommy. I have a creative side, even if it has a time limit of whenever my children are not in a Battle Royal. One of my older posts shows off my strong-willed nature when I want something bad enough, and it's crafty too. Check it out here. 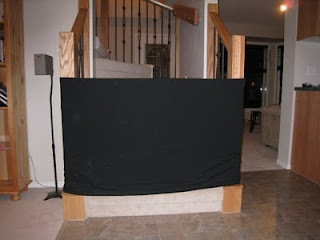 One of my favourites was my homemade "baby gate". We moved to a new home and A just loved climbing up the stairs. 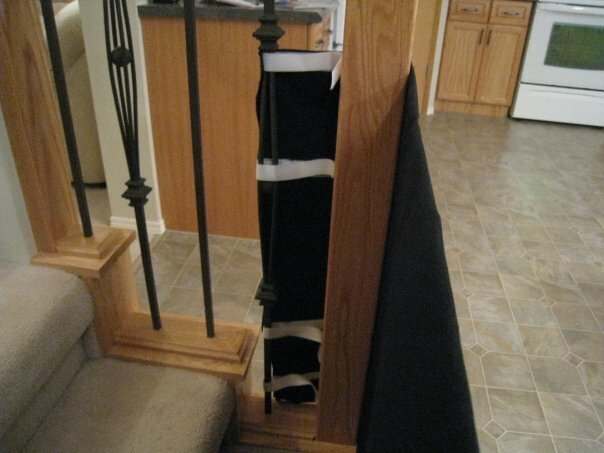 Terrified of her falling and knocking herself silly I knew I needed a baby gate. One problem. I did NOT want the rubber pads on the baby gate to wreck the wood on my stairs. So, I resolved to find a way to keep my baby safe and not destroy one of my favourite things in our home. We had a ton of boxes from moving and I had a whole box of material in my basement. It was given to me and seeing as I really don't sew I didn't know what I was going to do with it. Could I really make something out of cardboard and material? How would I keep it up? Yeah, I'm smart. It took a bit as I hand stitched the whole darn thing. But I did it. I had black material and a lot of it. So I went with that. I cut out a panel of the large side of a box and covered that in the material. First I "measured" the material by putting it up against the stairs and figured out how long I needed it. When stitching in the cardboard I wanted to make sure it was as centered as possible, then I pinned it in all the way around, as close to the cardboard as possible. I didn't want the cardboard to move as it was much shorter than the length needed. The width was about 2 inches longer than I needed. Once that was all done I then stitched the open sides together. Now I needed to figure out how on earth I was going to get it to stay up. It didn't take long before I thought of the velcro. It worked great. The beautiful wood didn't get wrecked and it kept my curious monkey from getting hurt. The extra two inches of material on the bottom gave off the illusion that the stiffness of the cardboard went further than it actually did. So my daughter never even thought of climbing underneath. She never touched the velcro either. Until much later when my 3.5 year old at the time, decided to show her how to get upstairs by undoing it. That is such a smart idea and turned out really well. Your stairs are gorgeous!